Read our full-time RVing blog for nomadic lifestyle tips. The support community for amputee pets and their people. 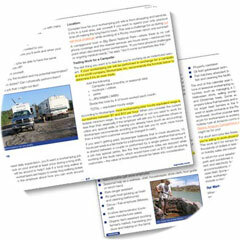 Download our handbook for location independent entrepreneurs. Jim Nelson and Rene Agredano grew their full-service marketing communications firm for ten years in a remote small town. In 2007, they hit the road in a fifth wheel trailer with their dog Jerry after he lost a leg to cancer. 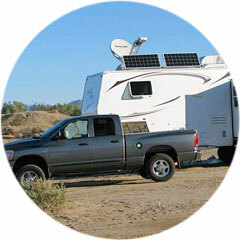 They have been full-time RVers ever since—working from home, in their mobile headquarters. Rene is a writer and makes jewelry. Jim is a graphic designer and builds websites. Help others learn how to make a living from anywhere. Still on the road today—with their three legged dog Wyatt—they have developed multiple proven revenue streams to support their nomadic lifestyle. 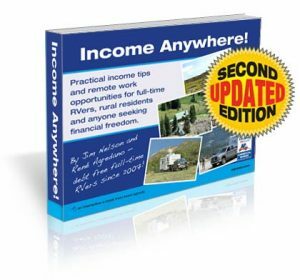 They offer complete details about how they do it in their location independent entrepreneur handbook, Income Anywhere! Get E-book Details, Free Sample Chapter and Download Coupon! Follow our full-time RVing adventures at liveworkdream.com for nomadic lifestyle tips. 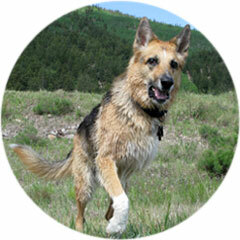 Tripawds is the largest online support community for amputee pets and their people. Learn about workamping and how to develop mutiple revenue streams for nomadic living. Join our team of remote marketing executives for world-leading health and wellness company! Learn all about workamping to supplement your income and explore new places! Find the best workamping jobs everywhere with this Workamper News Promo Code. Our summer weather winter getaway ended once we pointed north and headed to Fort Collins for the 2019 Colorado Marathon. Dam photos from 12+ years RVing around the country. The answer to “Is workamping worth it” depends on whether or not you’ve found a job as awesome as we did at Vickers Ranch.